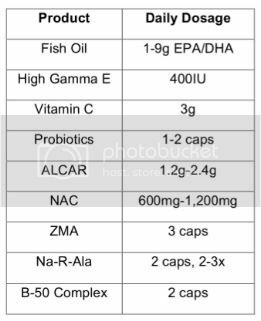 For the next installment of McDougal bloggery, I’m going to detail my groundwork health stack, something that just about everyone should be taking to cover their bases for optimum biological function in conjunction with a healthy diet. If there’s ever been a supplement that has resoundingly earned the title of “no brainer”, this is it. Dosage: Label recommendations have yet to catch up to real world experience on this one; I’ve found fairly high doses to be key. 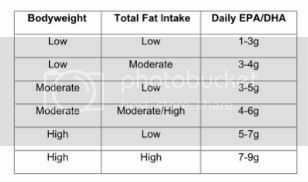 Match the dosage to your bodyweight and total fat intake; always take with food in at least 2 divided doses, away from weight training (see chart). Vitamin E is actually a combination of eight different isomers, four tocopherols and four tocotrienols. Unfortunately most of the Vitamin E you’ll find is a piss-poor form called dl-alpha tocopherol. This is NOT what you want. In fact, this particular form does a good job of lowering gamma tocopherol in your body, which is like pulling cops off a crime scene. Aside from dominating the Vitamin E shelf space at health food stores, the synthetic dl-alpha form can also be found playing a starring role in research sponsored by the pharmaceutical industry attempting to scare you silly while concurrently providing warm fuzzy comforting research about the undying sexiness of statins. What you DO want is a natural form of Vitamin E, high in the aforementioned gamma tocopherols (the kind found in foods). Multiple studies have shown that patients with advanced states of cardiovascular disease show a reduction in plasma gamma tocopherol, yet they show normal levels of alpha tocopherol. Dosage: A little goes a long way. Take 400IU once per day with a meal containing fat, away from weight training. Another obvious choice here with the layman’s vitamin, won’t spend a lot of time beating this one into your head. I like to see people take mineral ascorbate forms (magnesium ascorbate, sodium ascorbate, potassium ascorbate) either individually or a blend. If you’re going to be taking it with a meal containing fat, opt for the ascorbyl palimate form. Otherwise take it in-between meals or without fat. Don’t be afraid of high dosages, pro-oxidant concerns can be laid to rest in the presence of other antioxidants. Dosage: 3g/day, divided doses, and like other anti-oxidants, take away from weight training. Rarely do I come across someone who can’t significantly benefit from daily probiotic usage. The body is constantly in a delicate balance between good and bad bacteria, and the bad often win the battle. Probiotics ensure that the good bacteria thrive, and the body can function optimally. Society’s overreliance on anti-biotics has encouraged good bacteria to become all but extinct, and even a few runs can be responsible for a chronic deficiency. Reverses damage from alcohol, stress, antibiotics, and poor diet. Dosage: 2 caps per day for a week, then 1 cap per day. Try to take 20 min after a meal. Dosage: 1.5g, once or twice a day on an empty stomach. Used intravenously in hospitals for acetaminophen overdose, this acetylated version of the amino acid cysteine has numerous health promoting capabilities. Empirically, I’ve found this compound to significantly accelerate visceral fat loss (deep abdominal fat that surrounds the organs), which is a great bonus. Dosage: 600mg, once or twice a day with Vitamin C, taken on an empty stomach. Avoid taking within 12 hours after drinking alcohol, but always try to take before. ZMA provides highly bioavailable forms of zinc and magnesium. Athletes and workout enthusiasts are commonly deficient in these two minerals, which can lead to a cascade of undesirable effects. Those that are deficient will notice an increase in strength, libido, sleep quality, immunity, and more. Available in capsules or the “Nightcap” which is a tasty root beer float flavored drink. Dosage: 3 caps before bed on an empty stomach. Or 3 scoops with 6oz water of the Nightcap. This is a highly stable “R” form of the powerhouse antioxidant Alpha Lipoic Acid. It has the unique ability to regenerate other antioxidants like Vitamin C and E, as well as glutathione. Due to its ability to transpose the GLUT-4 receptor to the cell membrane, it has become a popular glucose disposal agent taken before carb heavy meals (the S-enantiomer prevents this GLUT-4 translocation, one reason for using the “R” form). Studies have also shown mitochondrial protection when combined with Acetyl L-Carnitine, which makes this a favorite with life extensionists. A combination of the B vitamins in adequate doses. Useful for so many processes and reactions in the body it’s silly to go without. Metabolic elevation, immune system support, reduction of symptoms of stress, depression, and more.